A family of terminal blocks with integral, reusable strain relief for use in appliances and other places where power has to be fed into an enclosure through a bulkhead or wall. The Z-GK Series is for use in appliances, controls, instruments and other equipment designed for North America and International Markets where UL, CSA, VDE, KEMA and SEMKO standards are accepted. 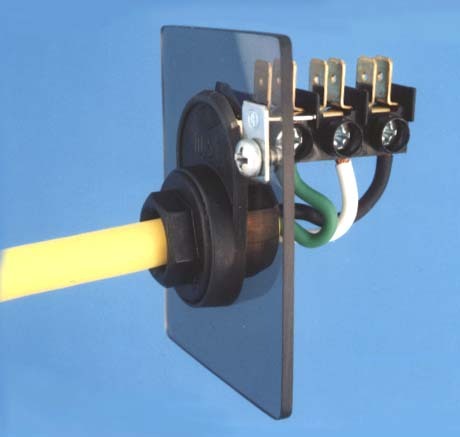 Ship your product pre-wired with the factory harness already attached to the Z-GK. The field wiring can be completed in the country of destination with a power cord of choice specific to the destination's country requirements. Ever changing requirements in the destination countries? Your distributor or customer abroad can take care of this for you.